A look at Trump's US travel ban and its effects. We gathered some first reactions to President Trump’s January 27th, 2017 executive order banning immigration from the countries of Iran, Iraq, Syria, Yemen, Libya, Sudan, and Somalia. The episode jumps from protests and marches in Seattle, Philadelphia, and the UK to the stranded Yemenis in Djibouti, and finally back to ourselves at Kerning Cultures. The purpose of this episode is to capture the emotions of those who are affected directly by the ban and those currently trying to help them. We look to the future and discuss what can be done to sway those who believe in the President’s actions; at the time of recording, support for the ban far outweighed the opposition. A man proudly holds the Libyan flag during the protest against refugee deportation and Trump's Immigration Ban Executive Order. Philadelphia International Airport. 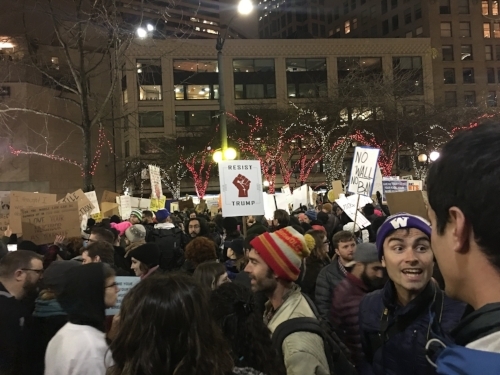 Protest rally at Westlake Center, Downtown. Estimates place the crowd from 8,000-10,000 participants. This episode was produced by Alex Atack, Razan Alzayani, Lilly Crown, Hebah Fisher, and Jackie Sofia, with special thanks to producer Dana Ballout for tracking down Nisa in Djibouti, and to Rabiya Shabeeh for fact checking. Sound design and original music by Mohamed Khreizat. Article written by Lilly Crown.